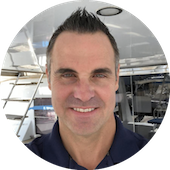 We asked Jim Ross of Just Catamarans to be our selling broker. We lived aboard our Lagoon 420 for several years. She was our home and we had so many wonderful memories of extraordinary places and sails with her. It was not just selling a boat, but so much more. Jim understood that it was a challenging time to sell. He was thoughtful in the whole process. From day one, he was superb in managing all aspects of the sale. He went the extra mile on numerous occasions with prepping the boat for the selling process, following through with troubleshooting and being alert to the care of our boat after we departed. He worked hard! He was strong in communication and follow-through. Honestly, it was an emotional decision to sell, but the selling process was handled competently and efficiently with Jim. He is a solid and trustworthy individual to work with.